Happy Gus LeGarde Day! We are now on our fourth Gus LeGarde Monday and the fourth book in the Gus LeGarde series. Mazurka takes place in Europe and sends Gus on more harrowing adventures. As it turns out, the author, Aaron Lazar, is currently visiting Germany, where much of our story takes place. "Join Gus LeGarde in this European roller coaster ride where he unearths a scandalous family secret linked to a nineteenth century composer. When brother-in-law Siegfried is framed for a neo-Nazi's murder, they're plunged into a sizzling cat-and-mouse game where stakes are lethal." "Aaron Paul Lazar writes to soothe his soul. The author of LeGarde Mysteries and Moore Mysteries savors the countryside in the Genesee valley of upstate New York, where his characters embrace life, play with their dogs and grandkids, grow sumptuous gardens, and chase bad guys." Because this book centers around the Neo-Nazi regime as the villains, as a Jew it resonates that much more with me. Gus and Camille's journey through Europe is supposed to be their honeymoon, but of course Gus can't go anywhere without attracting trouble...in this case the Neo-Nazis. As Gus and company are racing around trying to lose the bad guys on their tails, they discover an amazing family secret having to do with Siegfried's (and Elsbeth's) great-great-etc. grandmother. Once again Aaron Paul Lazar has written an intriguing mystery that's sure to leave you wanting more Gus! With danger lurking around every corner, a twist that's sure to leave you with your mouth hanging wide open, and another twist that will bring you to tears, I'm sure you'll love every page. 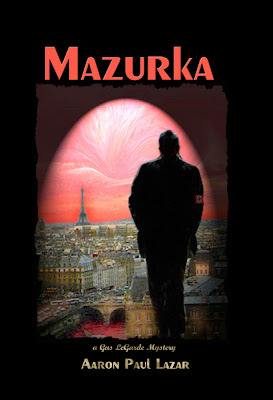 Cost: You can buy Mazurka: A Gus LeGarde Mystery from Amazon.com for $16.95. Overall: We give Mazurka a 10/10! We were sent copy of the book "Mazurka" free of charge for the sole purpose of this review; no other compensation was received. All opinions expressed are my own. I love to go to one of the great lakes on vacation. I would love to go back to anywhere in Alaska. I miss the slower pace of life so much! My favorite vacation spot is the beach area of La Jolla and San Diego. Central Florida is a great vacation spot! I have a love for islands.... any sunny island will do! I really like Daytona Beach, FL.